I completed a 7.2 mile, 5 hour hike today (including rests), ascending to the summit of Mt. Moosilauke via the Benton Trail. 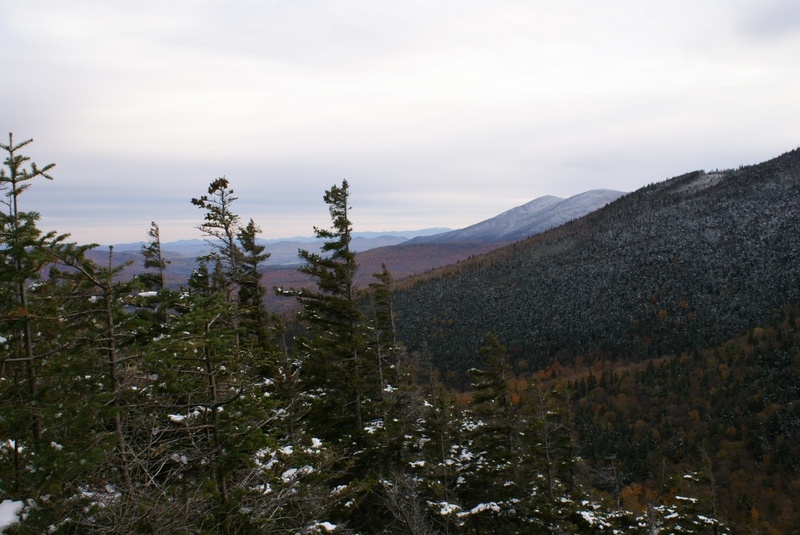 Benton is a moderately steep trail, ascending via a ridge on the north side of the mountain. I estimate the hike to have burned about 3,000 calories, assuming a burn rate of about 700 calories an hour for this activity. I traveled to the trailhead in the early morning, actually dark when I left the house. The dawn was breaking as I got close. Peeking through the windows, I could see that the ridges rising from either side of the valley I was driving through seemed light in color. “Snow” crossed my mind, although it was so early, I wasn’t quite sure. When I found the trailhead (a bit of a trick, driving literally right off the road as far as my NAV was concerned), the light was pretty good, and I didn’t see snow anywhere. So, I suited up with the expectation of a fall hike. Now, it was cold – 28F – when I got out of the car. So, I was prepared for it to get colder, as it inevitably does when ascending. I wasn’t expecting what I ended up with, though. The start of the hike was a borderline disaster. There was a stream crossing about a tenth or two in, and I blew it. Streams are usually no big deal for me, but I managed to place a foot wrong, ending up with my right leg calf-deep in cold water for a second or two. That was just a quick dip, and my boots are fairly waterproof, but I stepped so deeply that a little water overflowed into my right boot. I walked on for a while, and felt my right foot getting a little soggy. I’d doubled-up my socks, so I decided to lose both right socks in favor of one of my remaining dry left socks. That worked. So…what to do with 2 wet socks? I wanted to dry them out, with the hope of putting them back on later. 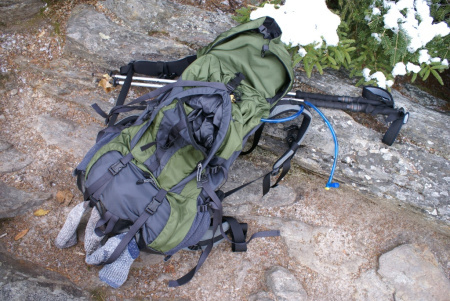 So, I hung them off of the compression straps on the bottom of my pack – a makeshift clothesline. Continuing up the trail, I saw a bit of snow here and there. Then I saw it more than “here and there”. Snow was everywhere – not deep, but covering the ground deeper and more evenly the higher I went. The question in my mind went from “I wonder if there’s snow on the summit” to “I wonder how much snow there will be on the summit.” “Should I turn around?” also crossed my mind, but I decided I’d go as far as I reasonably could and not turn back unless it would have been foolish to press on. While the snow was increasingly prominent with vertical feet, it was not deep at all. In fact, the snow was packed around rocks, making the going a little easier in places. Of course, the ice that formed in certain parts of the trail were no fun to navigate, but my trekking poles made that easier to cope with. 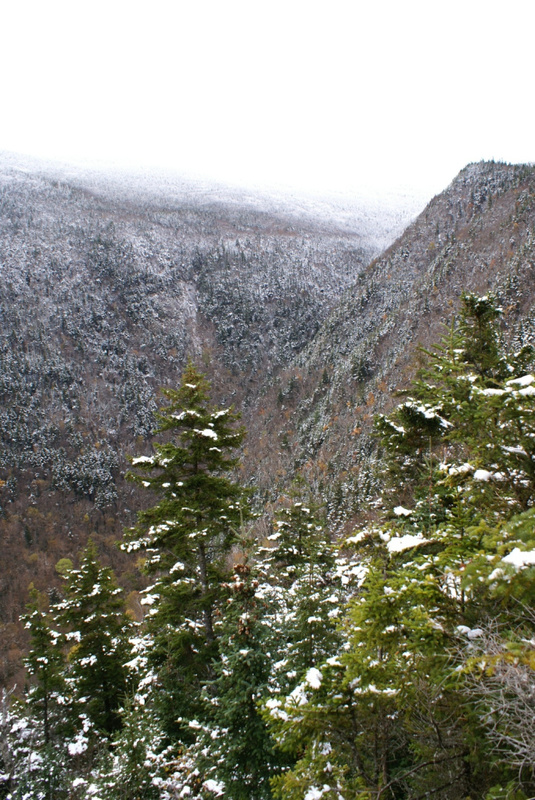 About a third of the way up the ridge, there is an overlook of Little Tunnel Ravine. The view was overwhelming. The 2 pictures below don’t do justice to what I was seeing, hearing, and feeling as I took it all in. Near the top, the trail enters the alpine zone. The evergreens were short and snow-covered, the world being far more white than green at that point. 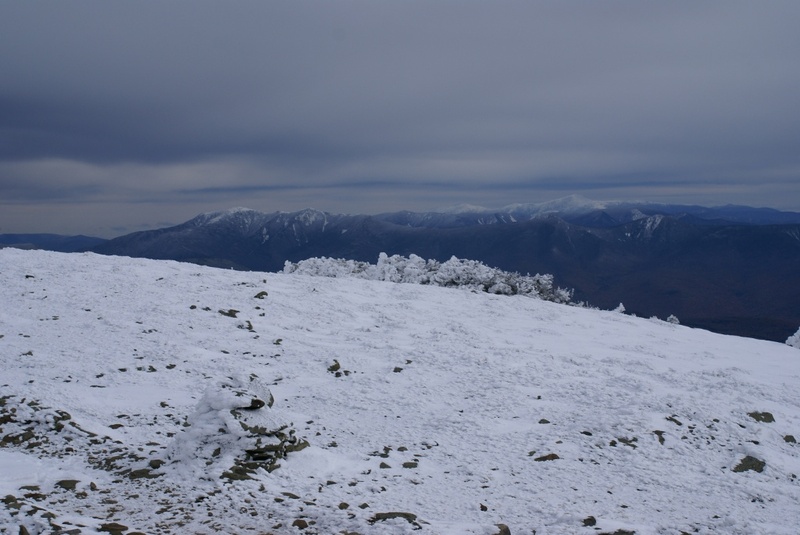 Near the summit, the trees disappear altogether, and you must follow cairns to the summit. When I popped out of the trees into the cairn section, I might as well have stepped onto the moon. 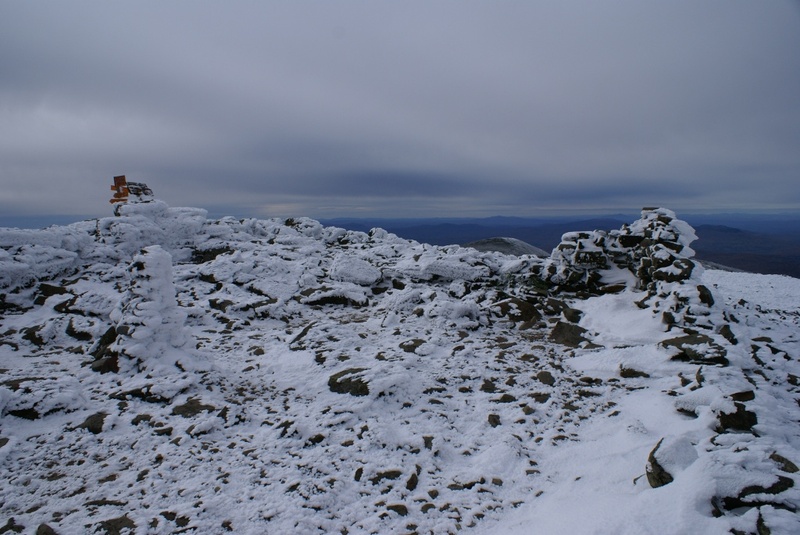 The rockscape was blasted white by sticky, windblown snow that covered everything. While it wasn’t snowing, it was windy. I immediately regretted not attaching my hood to my parka shell when I layered it on before the final push to the summit. The wind was hard to handle with just my fleece skullcap on. The tips of my ears were showing, and the wind was actually getting through the hat to my balding head. I just charged ahead for the summit, not that much further in front of me. 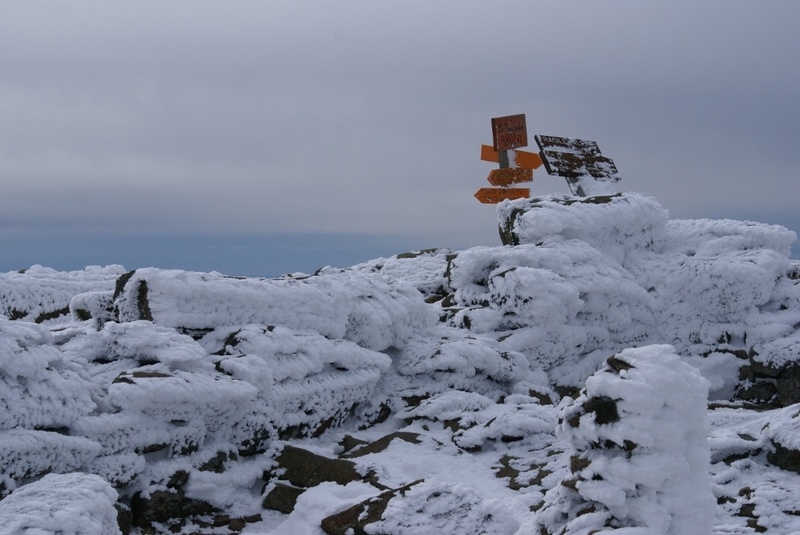 Orange signposts point toward trails and brown signs warn of alpine vegetation. I found some relief from the wind hiding behind one of the rock walls left over from the summit house of yesteryear (see the second paragraph on the linked page). That allowed me to get my hood attached and also snap some pictures. Gaiters are a necessity – simply not optional when crossing streams and stomping about in snow. Wet socks hanging on makeshift clothelines freeze – they don’t dry. <sigh> It was worth a shot. Corduroy pants don’t work…not that I would have expected them to in snow, but I wasn’t planning on snow, don’t forget. I’ve been looking for pants that shed snow but still breathe, just haven’t coughed up the money yet. Drinking tubes freeze. I usually drink with a hydration reservoir in my pack; the tube hangs out of the pack and you drink on-the-go. My reservoir holds 2 liters, and it’s more convenient than carrying bottles. But – it ain’t no good if you can’t drink from it. Not sure what I can do about that. Seems like someone’s run into this problem and there’s a solution already…haven’t looked yet.